The bottle was buried in a concrete wall in a school that prisoners had been compelled to reinforce. The school's buildings, a few hundred metres from the camp, were used as warehouses by the Nazis, who wanted them protected against air raids. Museum experts have checked the authenticity of the note, the Associated Press news agency reported. Six of the prisoners were from Poland and one was from France, AP said. "All of them are between the ages of 18 and 20," the final sentence of the note reads. An Auschwitz museum spokesman said the authors of the note "were young people who were trying to leave some trace of their existence behind them". 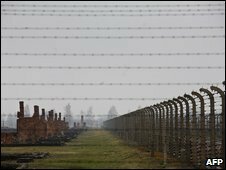 The Nazis murdered some 1.1 million people at Auschwitz - mainly European Jews, but also non-Jewish Poles, Roma (Gypsies) and others.